What Day Of The Week Was February 18? 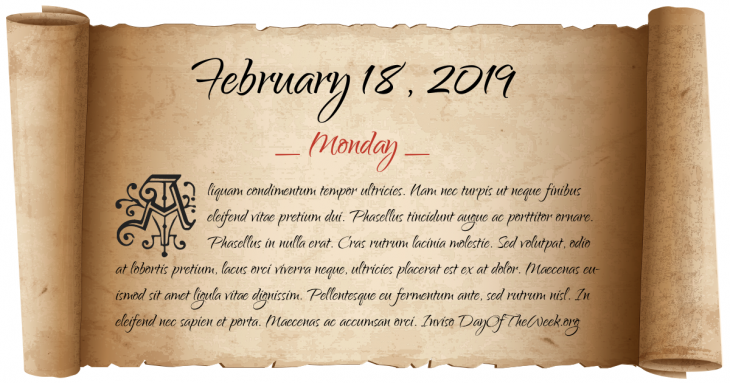 February 18, 2019 was the 49th day of the year 2019 in the Gregorian calendar. There were 316 days remaining until the end of the year. The day of the week was Monday. Fourth Anglo-Dutch War: Captain Thomas Shirley opened his expedition against Dutch colonial outposts on the Gold Coast of Africa (present-day Ghana). Beginning of the Galician peasant revolt. Union forces under Major General William T. Sherman set the South Carolina State House on fire during the burning of Columbia. The first Church of Scientology is established in Los Angeles, California. The California Supreme Court in the case of People v. Anderson, 6 Cal.3d 628 invalidates the state’s death penalty and commutes the sentences of all death row inmates to life imprisonment. New Year’s Day in Chinese calendar. Start of the year of the Fire Snake in Chinese astrology. The Space Shuttle Enterprise test vehicle is carried on its maiden “flight” on top of a Boeing 747.
Who were born on February 18?